If you’ve been following LupinRanger VS Patoranger, you might be all too familiar with Tsukasa(PatRen 3) and her obsession for all things cute and plush. And for those of you that might be looking for that sweet, sweet release P-Bandai has just the thing. A trio of adorable plush key chains just went up for pre-order, representing Tsukasa’s obsession and first off we have , the shark plush from episode 4 of the series in addition to Fuwa-Pan and Jagaton which were the focus of episode 13. All three will be released in July for the modest price of 2,700 yen. Premium Bandai has revealed a very special exclusive set to celebrate the 10th anniversary of fan-favorite series Kamen Rider Den-O! 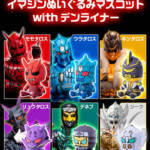 The iconic IMAGIN creatures from this series have been brought to life in plushie form, with a set of all 6 main creatures- Momotaros, Urataros, Kintaros, Ryutaros, Deneb, and Sieg! And to complete the ensemble, the six plushies will also come with a special carrying case modeled after the Den-Liner train! This team of plushies will be released in November 2017! The price is a modest 9720 Yen before shipping and fees. 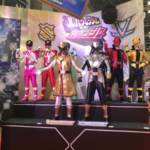 Get ready Uchu Sentai Kyuranger fans – your hearts are about to melt! 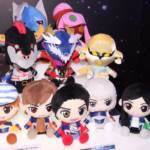 Check out these upcoming Uchu Sentai Kyuranger plushies from Tokyo Toy Show 2017! As of this exact moment we’re still deciphering release date, price, and the exact manufacturer. Stay tuned!